Reminder of the day: When engaging in email marketing, check your html on all the major email clients to ensure your message is rendering exactly as desired. The following image is from Entrepreneur Magazine’s weekly digest. 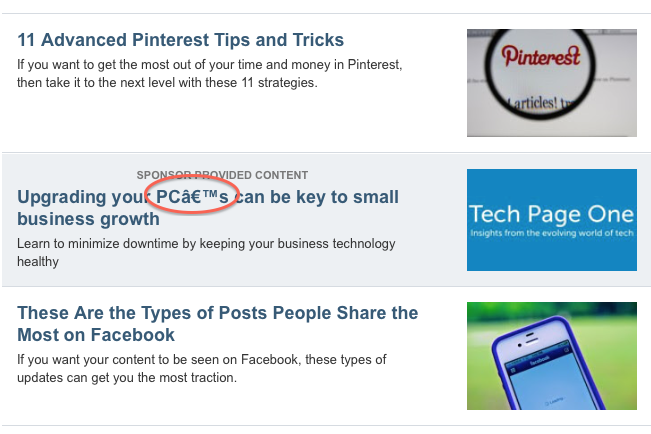 Note the middle spot, which is “Sponsor Provided Content.” Someone paid quite a bit to have their message garbled. This is how it looked in Gmail, the most popular email provider. While you cannot account for very possible browser based email service or app/client, you should at least test the big three (gmail, hotmail/outlook, yahoo) yourself, as well as consider services such as Litmus and Email on Acid. Remember the carpenter’s rule: measure twice, cut once.